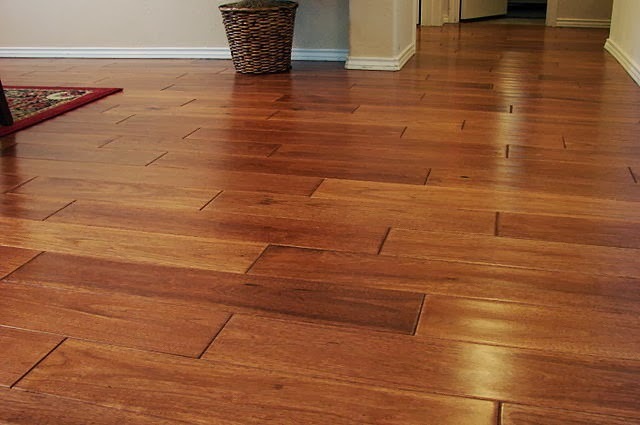 Cleaning your hardwood floor is actually a pretty simple challenge. Dry dust mopping and sweeping do the trick for regular cleaning needs. But what do you do when you have a trickier floor maintenance issue? How do you handle scratches or scuff marks? What if you need to clean a dried on spill? Kermans hardwood flooring store in Indianapolis has a few tricks up our sleeve to help with tricky hardwood floor cleaning challenges. For light scratches, lightly rub fine steel wool over the scratch. Be sure to rub in the direction of the wood grain. For deeper scratches, use lightweight sandpaper on the scratch - again rubbing with the grain. Use a damp cloth to mop up the dust after you're done removing the scratch. If a scratch has penetrated deep enough to expose bare wood, fill it in with a stain that matches the floor color. Stain markers and blending pencils are commonly available in a range of tones; check with your manufacturer or call Kermans for a recommendation. A soft scrub usually removes scuff marks or footprints from rubber-soled shoes. Use an old - but clean - tennis ball to gently scrub off the scuff mark. Another common trick is to use a new, large, pink pencil eraser. Wipe the scuff mark with a damp sponge and then rub the eraser over the scuff mark. If you walk into the room and see a dried up stain or spill, don't despair. First use a butter knife to gently scrape up the spill. Rub the area with a slightly damp cloth and then dry. Need a little extra effort to remove the stain? Most common household stains - crayons, nail polish, food - can be removed with a soft cloth dipped in a mild dish washing detergent. The tips above came from hardwood floor manufacturers and the American Hardwood Information Center. The AHIC has a more detailed list of "hardwood first aid" that is also helpful. Before trying any of the techniques mentioned above or from the AHIC, check your manufacturer's warranty. Learn more about hardwood floor from one of the best Indianapolis hardwood flooring stores: Kermans! Our wide selection of hardwood, expert design assistance and decades of experience will help you find the perfect hardwood floor for your lifestyle and budget. Stop by our showroom to learn more.